I thought I would do a post about our recent holiday to Skye. It really is such a beautiful place, especially when the sun eventually shines! We stayed just north of Portree, near Loch Snizort. My Uncle and Aunt live there, and my Aunt's sister has a holiday house that she rents to family and friends. So we had the perfect combo of staying near and visiting family but the independence of our own accommodation. Warning: this is a very long and picture heavy post, which only features a smidgen of sewing. Coral Beach, near Dunvegan (the white beach below) is said to be covered, not in sand, but in tiny bits of coral. Apparently it's actully algae, but I guess "Algae Beach" doesn't have quite the same romanticism. It's about a mile's walk from the carpark, and as we didn't take the baby backpack with us, we had to carry Baby Boy all the way. His first ever time on a beach. He quite liked it. On Baby Boy's birthday we were looking for something local to do that wouldn't take too long, to allow us all to get some fresh air and burn off some energy before the next rain shower. We discovered St Columba's Isle, a very small island in the River Snizort, on which St Columba founded the cathedral of the bishops of the Isles. The island has remains of several buildings and graves ranging in age from 11th century to the 1960s. On the Thursday, my Uncle and Aunt very generously not only babysat the boys, but also treated P and I to lunch at the Three Chimneys, a Michelin starred restaurant. It was amazing. Afterwards, as it was a beautiful day, we took a drive out to Neist Point, which has gorgeous views and an abandoned lighthouse. Unfortunately we forgot the camera, so these are iphone pics. The white blobs are seals. As it turned out, this sign was VERY out of date. On our last full day, we went dinosaur hunting. Apparently Skye used to be attached to North America, back in the Cretaceous (or Jurassic or whatever) period, so there are lots of fossils and dinosaur remains, particularly around Staffin. We went to a cafe called Skye Pie for lunch, which sold... you guessed it: pies. The cafe also had a crafty vibe to it. You could write your name on a tag, and they would embroider it (or, you could embroider it yourself), and they then hung it on the ceiling. See below. Funny how sewing seems to be incorporated in everything I do!!! The pies were delicious too. We bought more to take home. We then went off to Staffin Beach, where there are Stegosaurus footprints in the rocks. We didn't find them, but we had great fun anyway. i'll finish on the best photo of the holiday. I'm not sure where exactly this was, but it was in Trotternish, on the way back to Portree from Staffin. It was one of those "stop the car - I need to take a photo" moments. I'm glad I did. Another week's roundup. Still going strong! 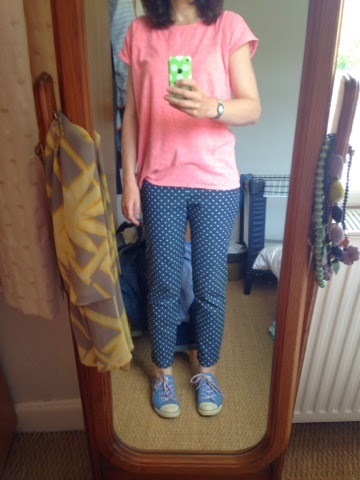 Day 16: Sew Over It Ultimate Trousers, with Oasis tee and crochet Converse. Day 3/8 of bottoms. A day of swimming lessons and gardening (I changed for the gardening, into RTW jeans with my quilted Linden (no photo though). 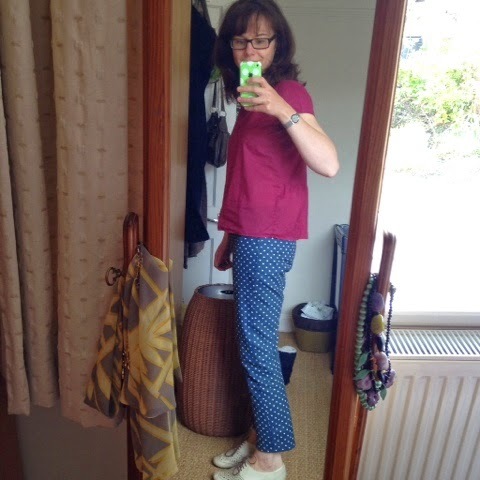 These trousers are so comfy, and I love them, even if Small Boy did tell me they looked like pyjamas, because, I MADE TROUSERS! Also, Baby Boy started crawling today! 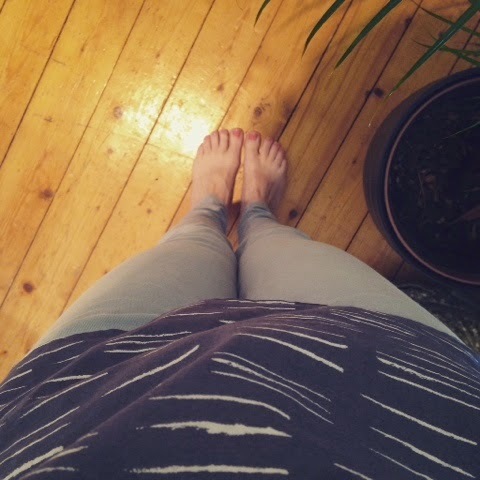 Day 17: Atelier Brunette Grainline Scout Tee with Whistles jeans, and presumably shoes at some point. Another day of gardening (again I changed). Day 18: A doubler! 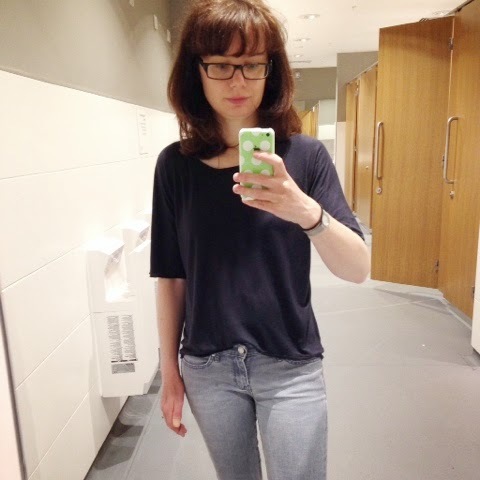 SOI Ultimate Trousers again (sorrynotsorry), with ruffle bum Grainline Scout tee and Clarks shoes. Day 4/8 of bottoms. My sister and her 2 kids came for lunch and a play. I think these trousers might be a bit marmite, I definitely noticed my sis checking them out, but she never mentioned them, which probably means she didn't like them. Day 19: another doubler. 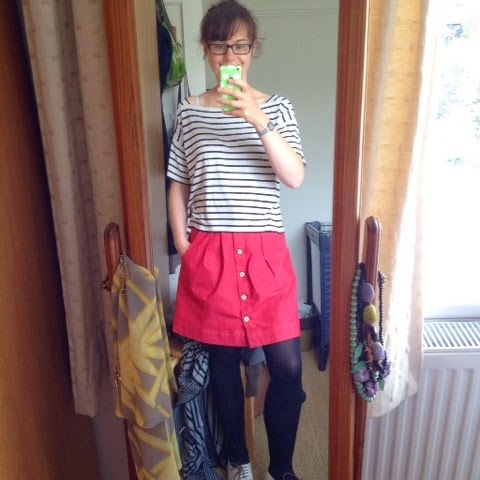 Megan Nielsen Kelly Skirt, with Marilla Walker Sailor Tee, plus Clarks brogues. Day 5/8 of bottoms. Baby Boy's first settle into nursery today, plus sports class, playing in the garden and sticking together and cutting out a PDF pattern. Not the best outfit given I spent quite a bit of time sitting on the floor today, but I liked this. 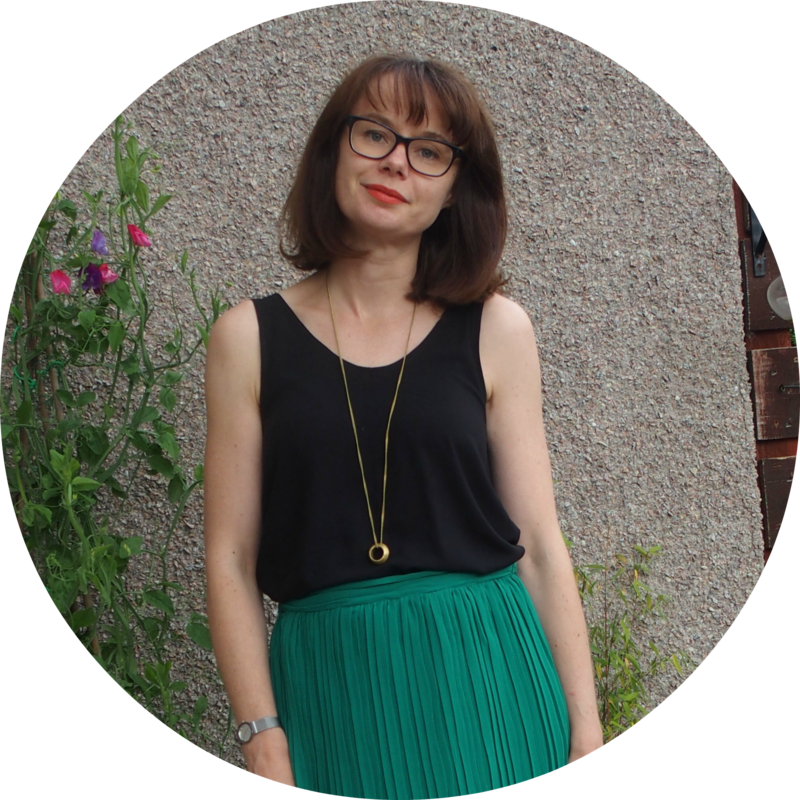 The tee has shrunk pretty badly (and unevenly), but i can just about get away with it with this high waisted skirt. Day 20: New Look 6356, plus Gap jeans and Converse. Made soup, nursery pick ups, play date. 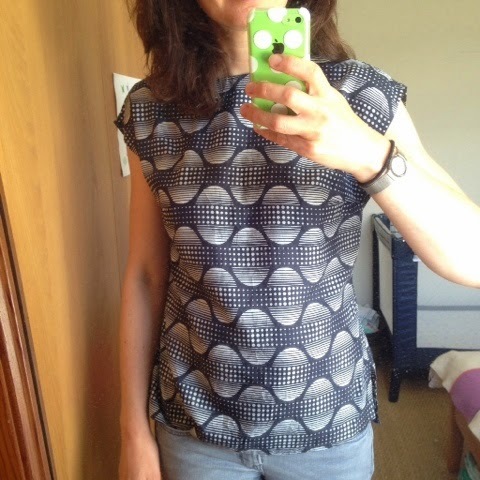 I'd forgotten about this top. I love the fabric. Day 21: Grainline Linden with Gap jeans. Quiet day in and around the house. Day 22 (part 1): Grainline Linden tee in jersey (unblogged) with Gap jeans and Converse. I had 2 hours to myself, as Baby Boy was having a settle at nursery (count down to return to work has begun), which I spent having a peaceful coffee and shopping for bras. 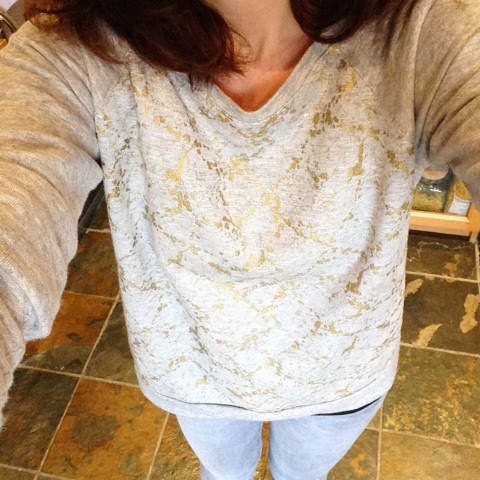 Day 22 (part 2): Lily Sage & Co Seachange Top. Hubby and I went to see Belle & Sebastian (my favourite band) in Glasgow. They were superb, as always. 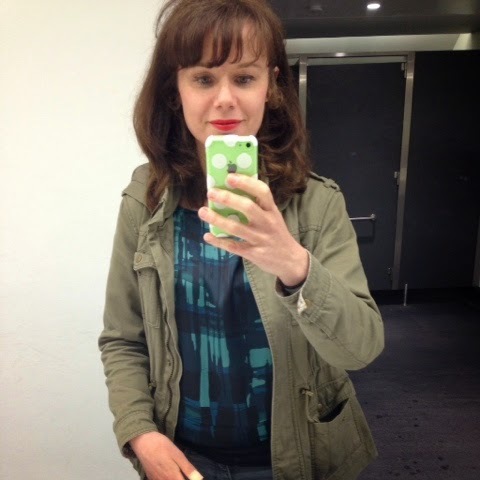 Second public toilet selfie of the day! No particular thoughts or relevations this week. I'm still enjoying Me Made May, and I'm even still OK with taking daily photos. I'm particularly loving joining in on Instagram, and the support and camaraderie on there. How are you going with it? Do you have fatigue yet, or are you still enjoying the challenge?